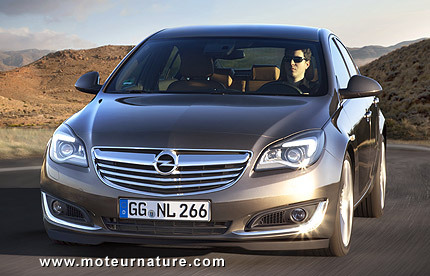 The Buick Regal started life as the Opel Insignia, a successful European sedan. It won the European Car of the year title in 2009. The Insignia’s getting a facelift this coming month, and it also receives new more fuel-efficient engines, gas and diesel. The diesel makes the most sales in this class in Europe, and the Insignia gets a brand new unit. A small 1.6-liter, this diesel gives 140-hp and 236 lb-ft of torque at very low revs. GM’s motorists worked hard to make sure this engine would give excellent fuel economy, and they’ve succeeded. To be fair, they had a good base car because the Opel Insignia has an excellent .25 Cd value. But the engine is clearly a champion, getting in the insignia an incredible 63 mpg combined fuel economy rating. It’s correct to say that official European fuel economy tests do not give very realistic figures, but even if they are 15% off, it’s still more than 50 mpg, which is fantastic for a comfortable sedan like the Insignia. This 63 mpg rating makes the Insignia the most fuel-efficient car in its class. No word about this engine’s going to America under the hood of the Buick Regal, but there could be customers all over the world for a 50 mpg sedan. A new downsized gas engine is also available, the 1600 SIDI Turbo, which gives 170-hp and gets a 39 combined mpg rating. This engine has much more chances to cross the Atlantic than the diesel.